Myths about Climate Change and Conflict? 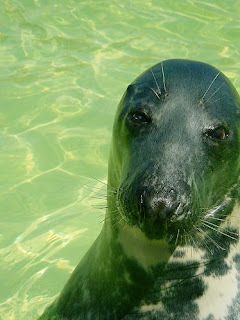 A “Green Seal” for arms control? 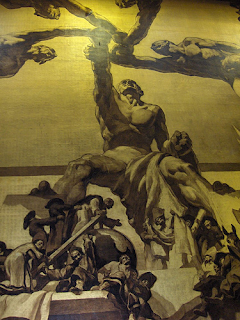 Last Chance for the Conference on Disarmament? If you were in the Palais des Nations last Friday morning, you might have heard applause emanating from one of the conference chambers. That was the end of the 2007 Meeting of Experts of the Biological Weapons Convention (BWC). In comparison to other events in the Palais like the Human Rights Council, it was a low-key gathering. It is, however, the latest chapter in the reinvigoration of multilateral efforts to strengthen the norms against poisoning and deliberate spreading of disease. One of the highlights of the meeting was the official launch of the new Implementation Support Unit (ISU) for the BWC. The ISU has three staff. As the ISU’s size suggests, it isn’t designed to solve the problem of biological weapons by itself. Rather, it was created to help states help themselves. They decided not to contain resources dedicated to addressing these weapons in a single monolithic institution but to keep them in the hands of governments and other international organizations, where most of the time they are dedicated to other issues, such as tackling naturally occurring infectious disease. Last week’s BWC meeting was an important opportunity for experts from governments, international and non-governmental organizations to meet and discuss national and regional measures and approaches to implement the provisions of the Convention. This year’s discussions had a special focus on law enforcement. While clearly not the stuff of newspaper headlines, this kind of collective work is absolutely crucial to building a norm that’s effective in preventing biological weapons, and identifying emerging risks to the regime. By all accounts the BWC meeting was considered a success, with many substantive proposals. As importantly, there’s a renewed sense of confidence present despite past difficulties stewardship of the Convention has faced. This will help move the BWC higher up national agendas and strengthen impetus for implementing its obligations. Although it’s clear that there’s no ‘one size fits all’ solution to implementing the BWC, a number of common understandings, themes and elements emerged during the course of the meeting. There was also a shared sense that better use could be made of the new ISU as a catalyst in better coordinating and managing implementation activities. Another important sense was that there’s a need to build national capacities – in addition to guidance and advice on enacting legislation and regulations, some states need practical assistance to be able to enforce and manage such measures. There is an old maxim that a chef is only as good as his last meal. So if the BWC is to continue to be at the forefront, it will be critical that each and every one of its meetings add something new to the ‘stockpot’. This one certainly did, and it bodes well for December’s menu. This is a guest blog by Dr. Piers Millett, a member of the BWC Implementation Support Unit team. The BWC Implementation Support Unit’s website can be viewed here. Video entitled "What You Should Know About Biological Warfare (1952)", available on Youtube at www.youtube.com/watch?v=a6NdxEmqvtk. Many of us have used the terms “hawk” and “dove” to refer to the different ways politicians view the world. Those with hawkish tendencies are supposed to be more likely to prefer to use military force against a perceived threat and to steer clear of offering concessions to adversaries. Doves, on the other hand, prefer to avoid using force in favor of finding non-violent solutions, if possible. Some psychology research suggests that humans may be predisposed to favor hawkish arguments because of our susceptibility to certain biases. In their article “Why Hawks Win,” Daniel Kahneman and Jonathan Renshon discussed some of these biases in an effort to explain the observed human tendency to prefer conflict over concession. Kahneman and Renshon argue that the overconfidence bias - the same bias that leads about 80% of all drivers to believe their driving skills are above average - “makes politicians and generals receptive to advisors who offer highly favorable estimates of the outcomes of war.” Experimental research has also shown that people show excessive optimism about success in future endeavors and that they have an illusion of control over future events. These three biases combined can significantly affect decision-making. The authors suggested that policymakers who viewed the 2003 Iraq war as a “cakewalk,” for example, were blinded by overconfidence, excessive optimism and an illusion of control. In addition to a tendency to overestimate our chances of success in an armed conflict, policy makers tend to intuitively reject concessions offered by an adversary. This is known as reactive devaluation. One experiment asked pro-Israel Americans to examine a peace proposal. When the proposal was attributed to Palestinians it was judged as biased in favor of Palestinians but when authorship was attributed to Israelis it was viewed as “evenhanded”. This can be a significant problem in negotiations, causing some to discount what was said because of who said it. •Choice B: a 90% chance of losing of $1,000 and a 10% chance of losing nothing. This isn’t to suggest that using force in response to a threat is never correct. The article does suggest, however, that psychological biases can influence important policy decisions like going to war, leading us to prefer more aggressive solutions when these solutions may not, in reality, be the best ones. This is certainly worth knowing, and is one way the behavioural sciences are prompting political analysts and policy makers to review some of the assumptions they take for granted in decision-making. Daniel Kahneman & Jonathan Renshon. “Why Hawks Win.” Foreign Policy, Jan/Feb 2007, pgs. 34-38. Photo “Red Tailed Hawk” taken by Patrick T. Power and uploaded from flickr.com. The Sunday Observer of 19 August ran a story that some leading British financial institutions have told it "they are about to withdraw hundreds of millions of pounds from firms linked to the manufacture of controversial cluster bombs. The move will be seen as a major breakthrough for campaigners such as Handicap International, the International Campaign to Ban Landmines and Human Rights Watch." Let's also remember the Cluster Munition Coalition. All of the Non-Governmental Organizations (NGOs) mentioned above belong to that international network of campaigners, which has played an active role over the last few years in the deliberations of the Convention on Certain Conventional Weapons (CCW) in Geneva and especially in the international "Oslo Process" that emerged from February this year. The Observer's story is further indirect evidence that, increasingly, cluster munitions are seen as a weapon with unacceptable humanitarian consequences by European publics. Investors see that as a risk, especially as efforts to restrict them gather steam. Certainly, spokespeople from major arms manufacturers such as Lockheed Martin and Raytheon asked for comment by the Observer seemed quick to deny their involvement in cluster munition production and trade, although they have been linked to it in the recent past. What the Observer article didn't discuss is whether - as seems likely - the investing institutions it mentioned from UK and France are taking their cue from others in this area. The Norwegian Petroleum Fund - Global, for example, is an investment big fish, with more than 200 billion Euro, making it one of the world's largest public funds. In 2005, the Fund's Council on Ethics recommended that the Fund pull out of investing in 7 cluster munition producers, which it did. It was judged that cluster munitions fail the fundamental humanitarian principle of distinction. You can read about how it happened and why in a chapter of our third volume of research here, written by Dr. Gro Nystuen, a member of that Council. Discussions in the CCW traditionally emphasized the military utility of cluster munitions. Not a lot of attention was given until recently to the moral or political acceptability of using a type of weapon that a range of evidence indicates is prone to indiscriminate use and deaths and injuries to bystanders. The military utility of a weapon shouldn't be confused with its effectiveness, which is a broader consideration. A weapon may fulfill the requirements of its intended military mission, but the negative consequences of its use may outweigh that usefulness. Clearly there is widespread public unease about the civilian "collateral damage" cluster munitions cause. (You can see the footprint of a cluster munition in the Youtube clip embedded in this post, and can imagine its effects on a populated area.) We're likely to see stigma against cluster munitions grow, which will strengthen international initiatives like those mentioned above. Gro Nystuen, "Investment policies and arms production - experiences from the Norwegian Pension Fund - Global", in Thinking Outside the Box in Multilateral Disarmament and Arms Control Negotiations (the pink book at left), UNIDIR: 2006. Information about the Norwegian Government Petroleum Fund's Advisory Council on Ethics, including its recommendations on a number of weapon systems, is available here in both English and Norwegian. Next week, over 100 States will gather in Geneva to see if they can come any closer to agreeing on a set of common standards that they should all apply when deciding whether or not to export guns to other countries. The goal is to stop so many guns from finding their way into regions, countries and hands where they are likely to be used to abuse human rights, violate the laws of war or otherwise kill or intimidate civilians (for some background on this, see my posting of 18 April 2007). This should be no ordinary multilateral conference on the small arms trade. For starters, it is taking place outside of formal UN frameworks. The venue is not the UN office in Geneva, where most official UN business takes place, but the international conference centre across the street. And, most radically of all, the wearing of ties has been officially discouraged, an unheard of deviation from standard UN practice! To understand the context of this meeting, we need to transport ourselves back to July 2006, to UN headquarters in New York, minutes before the first Review Conference of the UN Programme of Action on the illicit trade in small arms and light weapons closed without UN Member States reaching any agreement on how to follow up on their 2001 pact to eradicate the black market in guns. As the meeting fell apart, the Canadian delegate, in an attempt to salvage something from the wreckage, took the floor to invite all States to Geneva the following summer to work on developing common standards to govern transfers of small arms and light weapons. To its credit, Canada followed through on its spontaneous invitation and a surprising number of countries have answered the call. So what does this meeting hope to achieve? On a very basic level, it aims to identify, clarify and underline commitments that UN Member States have already made to transfer guns responsibly. These existing commitments derive from a variety of sources, including international humanitarian law, international human rights law and Security Council resolutions, not to mention treaties and agreements to which States are already party. The meeting also aims to elaborate specifically on the commitments that all UN Member States have made in the 2001 UN Programme of Action on small arms regarding transfers of small arms. Simply put, next week's meeting seeks to engage as many States as possible in collectively identifying and refining principles to govern all transfers of small arms and light weapons. But this is as far as collective action would go. The task of interpreting and applying such principles would remain at the complete disgression of each individual State. But next week's meeting is not taking place in a vacuum. 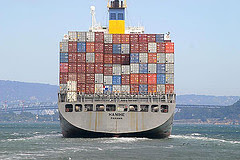 In a separate but related process, a record number of UN Member States have submitted their ideas to the UN Secretary-General on what they would like to see contained in a proposed new legally-binding agreement to regulate the transfer of all conventional weapons, from guns to aircraft carriers - the so-called Arms Trade Treaty. It would seem that governments are finally paying serious attention to regulating the global arms trade. If next week's meeting can move us one more step along that road, it will be time well spent. Informal Meeting on Transfer Control Principles for Small Arms and Light Weapons, 27-31 August 2007, Geneva. Photo credit: NorthSun on flickr. Last week, I came across an article published on Foreign Policy magazine’s website entitled “The New Myth About Climate Change” by Idean Salehyan, an assistant professor of political science at the University of North Texas. Global warming occurs over a long period of time, and it is true that its effects have largely been subtle. The emerging scientific consensus, however, is that the most important effects of global warming are still to come (see reports by IPCC, the Intergovernmental Panel on Climate Change). Is global warming likely to increase the probability of conflict? Yes, is what a growing chorus of experts thinks. There are several ways in which specialists believe global warming will impact on the likelihood of conflict. This includes border disputes, migration movements, energy and other resource shortages (notably, freshwater, cultivable land, crop yields and fish stocks), which may lead to societal stress and humanitarian crises, as the British government outlined in its UN Security Council paper. I don’t agree with that. Salehyan’s linear way of thinking is simplistic and fails to comprehend the truly complex nature of conflicts’ dynamics. Conflicts are complex social phenomena that result from inter-relationships between several (if not myriad) factors. This means that, as global warming increases the chances of conflict, other factors – for instance, social, economic or political conditions – are at play and combine their effects to create a global trend. Crucially, Salehyan has made his inference based on an apparent correlation between climate change and conflict during a particular period of time. Yet neither climate change (nor the number of conflicts) follows a linear trend. The number of conflicts can fall, but then abruptly rise again and we cannot predict what will happen based on assertions of past incidence of conflict. Moreover, while it is true that, historically, the incidence of inter-state war has fallen in the recent years, other forms of conflict have emerged. Salehyan argues that “if the environment drives conflict, then governments bear little responsibility for bad outcomes.” This is misleading and absurd. Stating that climate change is a contributory factor in conflicts – like in Darfur, example cited in Salehyan’s paper – doesn’t excuse nor remove responsibility from governments. I don’t understand Salehyan’s logic here. “Dire predictions about the coming environmental wars” imply, in my opinion, that we must take measures to reduce global warming, and we need to start now to design solutions in order to anticipate the consequences of climate change and limit its humanitarian impact as much as possible. Dire predictions instead strengthen the road for strong, effective international institutions and flexible, collective action, because no state can deal with the impacts of climate change on its own. If, with this paper, Salehyan’s intent is to provoke controversy, he’s succeeded. But maybe it’s time to raise the level of the debate. Idean Salehyan, The New Myth About Climate Change, posted in August 2007 on Foreign Policy and available online at http://www.foreignpolicy.com/story/cms.php?story_id=3922. The UK’s concept paper and other documents from the UNSC discussion can be found here. Photo by Oyzman retrieved from Flickr.com. In between many of the serious issues we try to follow on the Disarmament Insight blog, a news story popped up last week from Reuters that begged for comment. It seems that people using computers traced to the US Central Intelligence Agency (CIA) and Federal Bureau of Investigation (FBI) have been editing entries in the online encyclopedia Wikipedia. This was apparently discovered with a piece of software developed by the Sante Fe Institute called WikiScanner. A wiki is a web site that allows collaborative editing of its content and structure by users. It's said to owe its origins to computer programmer Ward Cunningham, from the Hawaiian "wiki-wiki", which means "quick-quick". Wikipedia is perhaps the best known, largest and most popular wiki by number of those who consult it. Reuters reported that, using WikiScanner, Wired magazine compiled a massive list of CIA and FBI edited Wikipedia entries. Apparently CIA and FBI computers were deployed to edit topics including the Iraq War and the Guantanamo prison. For instance, aerial and satellite images of Guantanamo were removed using a computer traced to the FBI. This isn't really as surprising as it might initially seem. After all, public diplomacy was a major aspect of intelligence and counter-intelligence activities during the Cold War. There were always jokes about diplomatic cultural attaches often being spooks. Propaganda, influencing public documents or manipulating perceptions about one's ideological system were par for the course. But the world of the virtual may offer more opportunities for Culture Wars to take on insidious meaning as recent attacks on Estonia's information infrastructure by hackers show. It raises a question: is there a clear boundary between manipulating the internet and tearing parts of it down? Clearly it's not a hot war on Wikipedia yet. Instead, the Reuters article noted that the CIA and FBI editing may violate Wikipedia's guidelines on conflict-of-interest. Meanwhile, the beauty of open-source online resources is that the editing process is pretty continual and, as the Reuters story noted, Wikipedia's "self-correcting". No doubt there will now be plenty of geeks out there even more vigilant than usual that their favourite wiki entries aren't tampered with by The Man. Meanwhile, it's not clear to me whether anyone (outside the CIA and FBI, at least) knows if Wikipedia edits done with their computers were officially endorsed, or were just someone surfing the web on their lunch hour. If the CIA and FBI are sneakily trying to manipulate openly available information sources it does seem to lack a sense of fair play. (But then who said government agencies have ever had much of a sense of fair play, anyway?) Nevertheless, it would have been pretty dumb to think someone, somewhere, wouldn't pick up on it. Wikipedia, for all of its flaws (and largely because of them), is a form of social engineering as well as a repository of knowledge. Its evolution is really quite fascinating from cultural and anthropological perspectives - this is just the latest bizarre twist. Image downloaded from Flickr (where, incidentally, the keyword "lightsaber" turns up more than 7,000 pictures). 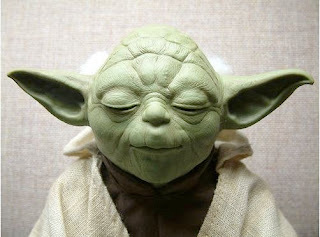 If your boss isn't looking, check out Wookiepedia, the Star Wars wiki. What can our ancestors teach us about building trust? The answer is an extraordinary amount based on what I heard at a fascinating workshop held on 25 May on ‘Human Security, Human Nature, and Trust-Building in Negotiations’, as part of the Disarmament Insight initiative. Their workshop brought together disarmament diplomats from Missions in Geneva, officials from the International Committee of the Red Cross (ICRC) and UN with considerable experience of disarmament negotiations, and researchers specialising in trust issues. The challenge posed for multilateral practitioners in the international security field attending the workshop was to think about how the information presented to them relates to their interactions, and to what extent their current community of practice leverages or impedes trust-building (something which John Borrie described at the meeting as ‘cognitive ergonomics’. Hear his podcast here.) Several speakers were invited to address the seminar, including Robin Coupland, the ICRC’s adviser on armed violence and the effects of weapons and a former war surgeon. The starting point for his presentation was that negotiating effectively on human security issues requires understanding the role our ‘nature’ plays in the use of weapons and in restraining their use. His brief talk set the scene for the workshop’s two main speakers, Frans de Waal and Paul Seabright. On the building of trust at the international level, an issue which he had been quite pessimistic about in his book ‘The Company of Strangers’, Seabright’s thinking reflected the dominant view in international relations theory which has been, in the words of John Mearsheimer, that ‘there is little room for trust among states’. What underlies this view is that because we can never have 100 per cent certainty about the current – and crucially the future – motives and intentions of others, we must assume the worst and plan accordingly. State leaders have to begin with the assumption of mistrust because to trust can be dangerous in an uncertain world. But it can be equally dangerous to mistake potential friends for enemies. The security dilemma that confronts governments is to decide whether they face what one participant called a ‘trust game’ or a ‘force game’ (see my ‘Putting ourselves in the shoes of our enemies’ post of 18 May). A category error in thinking about trust is to associate it with the elimination of uncertainty, because if we had certainty, we wouldn’t need trust. Other disciplines, notably psychology, sociology, and philosophy recognise that trust and uncertainty are mutually implicated, but these ideas haven’t been systematically applied in international relations. Ken Booth and I map out the beginnings of such an engagement in our forthcoming book The Security Dilemma: Fear, Cooperation and Trust in World Politics, arguing that although uncertainty will always exist in world politics, this needn’t preclude processes of cooperation and trust-building. The challenge is to explore in greater depth what other disciplines might contribute to thinking about trust at the international level – hence the 25 May event and the establishment of the interdisciplinary research network on trust-building in world politics (TrustNet) which is being set up at the University of Wales, Aberystwyth under the auspices of the David Davies Memorial Institute of International Studies. A key theme running through the day’s discussions concerned how actors who were committed to promoting cooperation and trust might signal their peaceful intentions. The immediate response from hard-nosed realists is that it isn’t possible for states to ‘signal type’ (to use the language of U.S. theorists writing about the security dilemma) because of the impossibility of distinguishing offensive from defensive weapons. Even if decision-makers are persuaded that certain military moves will send a decisive signal of their peaceful intentions, thereby triggering a virtuous circle of cooperation if others are committed to the ‘trust game’, they might be so fearful that such a reassuring move will expose them to great danger if it is not reciprocated, that they’re not prepared to take such risks for trust. Seabright recognised in his presentation that this dilemma faced the earliest human groups as they had reached out to cooperate with others. We have no idea how many of our ancestors perished because they mistook an enemy for a friend. Seabright rightly praised those who took such risks as the unsung heroes of humanity. Without these early risky experiments in cooperation and trust, humans would never have evolved the combination of ‘calculation’ and ‘reciprocity’ that, Seabright argued, has made us so good at detecting cheats and spotting co-operators. Here, the human capacity for smiling, and especially laughter, has been essential in enabling humans to signal their type. But the grand enterprise of trust between strangers that has developed from this has been far more impressive within societies than it has been between them. If new structures of trust are to be built at the international level, then peaceful/defensive states will have to do better at signalling their intentions. Here, we might ask what the equivalent of ‘laughter’ is for diplomats negotiating, for example, to denuclearise the Korean Peninsula or resolve the uncertainties, fears, and mistrust surrounding Iran’s nuclear programme. And will decision-makers play the ‘trust game’ if the consequences of misplaced trust might be a permanent exit from the game itself? It isn’t only our earliest human ancestors who might have something to teach us about the importance of taking risks for trust. In his presentation, de Waal explained that chimpanzees are far better at reconciling than humans, though they also seem to have a greater propensity to fight. What’s fascinating here is that a male chimpanzee signals his desire to reconcile with another male by placing himself in a position where if the other chimpanzee rejected his olive branch, he’d be vulnerable to attack – a perfect illustration of primates ‘signalling type’. Decision-makers are more likely to take risks for trust where there is what Booth and I call a margin of safety, but primates appear to reconcile without such a safety net being in place. Given that there may be situations where it is only possible for a state to signal its peaceful intentions to its adversary by exposing itself to significant risks in the event that its trust in the peaceful motives and intentions of the other proved unwarranted, the challenge facing leaders in these cases is whether to take a ‘leap in the dark’ (the phrase comes from Robert Schuman, French Foreign Minister, when launching his bold plan for European integration in 1950). ‘Leaps in the dark’ clearly involve risks and dangers. But in weighing these up, decision-makers need to remember that ‘playing it safe’ – applying worst-case thinking because there are no guarantees about the current and future motives and intentions of others – brings with it the risks and dangers of a self-fulfilling prophecy of security competition no one intended. There is no escape from risk and uncertainty in our world, and whilst this is so, a concept like trust will remain both elusive in conception - and hence worthy of interdisciplinary study - and indispensable to our global future. More on the work of the DDMI in the area of Trust-Building is available on the Institute's website. Booth, K. and Wheeler, N.J., The Security Dilemma: Fear, Cooperation and Trust in World Politics (forthcoming Palgrave Macmillan 2007). Mearsheimer, J. J. (2001) The Tragedy of Great Power Politics, New York: W.W. Norton. Seabright, P. (2004) The Company of Strangers: A Natural History of Economic Life, Princeton, NJ: Princeton University Press. What do environmentalists know that the peace and security community doesn’t? Well, for one thing how to use the business’s community marketing machinery to support their goals. One of the biggest trends in marketing in recent years is “green marketing” in which businesses lay claim to environmental bona fides as a means of encouraging affluent consumers to purchase their product or not shy away from doing so. A soymilk manufacturer sponsors a “Green Caps for Green Energy” program, a bottled water distributor supports global clean water efforts, a travel agency supports sustainable development projects. And then there’s all the companies from British Petroleum to Starbucks that seek to shrink the environmental footprint that they leave. Outside the environmental field, there’s all sorts of similar efforts: Virgin Mobile is tying its sales effort to efforts to get homeless young people off the streets; Microsoft is willing to donate money to a variety of causes from the National AIDS fund to UNICEF for every Instant Message a customer sends; Ralph Lauren is opening a series of Rugby stores dedicated to volunteerism and community service. Yet, as far as I know no similar efforts have been made in the peace and security community (and I’d love to be corrected if I’m wrong). It’s not clear why. To be sure, there are some obstacles—security policy is inevitably more politically charged than giving money to health issues, for example. And it’s also often far more complicated to explain. Yet, it seems that there should be possibilities for winning support nonetheless. What about companies interested in the developing world contributing to gun buyback efforts or efforts to clear landmines, cluster munitions, and other explosive remnants of war? Since UNICEF and UNESCO are using companies’ marketing efforts to raise funds, how about raising additional revenue for the inspection efforts of the International Atomic Energy Agency and Organization for the Prohibition of Chemical Weapons? As in other areas, companies are also interested in avoiding the damage to their reputation that might occur if they are tied to arms trafficking or dangerous weapons. At this summer’s Carnegie Nonproliferation Conference, for example, Ralf Wirtz of Oerlikon Leybold Vacuum talked about how his company, tarnished after inspectors discovered that some of its dual-use equipment was used in Iraq’s weapons of mass destruction programs, overhauled all of its export control procedures and decided to work pro-actively with governments. Many corporations, however, see little incentive or are provided little guidance in how to tighten their end-use monitoring absent any embarrassing disclosure. Wouldn’t it be useful if there was a peace and security equivalent of Green Seal, which certifies products and services as environmentally responsible? This is a guest blog by Miles Pomper, editor of Arms Control Today, the monthly magazine of the U.S. Arms Control Association. Dis Insight editors’ note: what do readers think? Use the comment function at the foot of this post to let us know. The Conference on Disarmament -- "the world's sole multilateral disarmament negotiating forum" as its 65 member States frequently remind us -- has featured either directly or tangentially in a number of postings on this blog (see in particular August 8 and March 28). And with good reason. In existence since 1983, the CD has negotiated such landmark agreements as the Chemical Weapons Convention and the Comprehensive Nuclear Test Ban Treaty (CTBT). Its antecedents, which date back to the Ten-Nation Committee on Disarmament of 1959-60, gave us the Nuclear Non-Proliferation Treaty, the Biological Weapons Convention and the Environmental Modification Convention. Despite its impressive track record, however, the CD has not been able to produce a multilateral disarmament treaty since finishing its work on the CTBT in 1996. This more than decade-long deadlock has its roots in disagreements on which issues to deal with next. There is broad agreement among CD member States that a treaty banning the production of fissile material for nuclear explosive devices is ripe for negotiation. A number of thorny issues would have to be worked out -- would existing stocks of fissile materials be covered and how, if at all, would such a treaty be verified? -- but the will is there to negotiate. The United States even put a draft treaty on the table in May 2006! However, some States, most notably China and the Russian Federation, would like to make such negotiations conditional upon making progress on preventing an arms race in outer space (PAROS). Both countries have fast-growing civilian space industries and are concerned about the lead that the United States has built up in space technology, with potential applications in both the civilian and military fields. Until quite recently, linking negotiations on fissile material with progress on PAROS was considered unacceptable by the United States. But this all changed earlier this year during a period of quite intensive discussions in the CD when the United States signaled its willingness to discuss ways to prevent an arms race in outer space in order to get negotiations on fissile materials off the ground. The scene was set for a historic breakthrough. It seemed for a time as if the CD might actually spring back into life. But the breakthrough has not materialised. China has been playing for time, arguing that it needs to study intensively the work plan that is now on the table. In the meantime, other countries have raised their voices with objections. Pakistan, for example, has argued that negotiating only on fissile material would be too narrow a focus for the CD and that negotiations should commence simultaneously on five issues! Having built itself up with initiative, hard work and a healthy dose of realism during the first half of 2007, the CD is again rapidly deflating. Whether it can recover from this latest disappointment and go on to live up to its past glory remains to be seen. What is clear, however, is that more and more governments are questioning the justification of maintaining disarmament Ambassadors in Geneva while the CD languishes. The more governments withdraw their most experienced disarmament negotiators to Capitals, the less likely it becomes that the "world's sole multilateral disarmament negotiating forum" will be able again to live up to that lofty description. As you’ve probably noticed, we have just included a new option that allows visitors to save Disarmament Insight blog postings in PDF format. It is now possible to have a printer-friendly version of all or just one of the postings on the site. Simply click the button "Save page as PDF". Click the button “Save page as PDF”. The human subconscious, it turns out, is more active than we think. And it can be primed in remarkable ways by seemingly mundane objects, smells and sounds, as a recent New York Times article outlined. The article reported, for instance, one recent study by Yale psychologists, which revealed that college students handed either a cup of hot or iced coffee on the way to class were influenced by the temperature of the beverage: when later asked to judge a person from a written description, those handed iced coffee rated them “much colder, less social and more selfish” than those handed hot coffee. In yet another experiment, students were placed in a cubicle in one of two rooms and asked to fill out a questionnaire. After filling in the questionnaire, the students were given a crumbly snack. Unbeknownst to them, the researchers had placed a bucket of water with a hint of citrus cleaner in one room but not the other. Sure enough, the students in the room with the faint odor of cleaning solution cleaned up the remnants of their snack three times more than the control students. The moral of the story, for me, is that we’re always trying to determine how we should behave in any given situation. But we may not be cognizant of all the factors influencing our perceptions, with the “conscious” brain taking directions from our subconscious that we didn’t even realize were issued. It begs an interesting question for me, working in the 80 year old splendour of the UN Palais des Nations (formerly the seat of the defunct inter-war League of Nations). 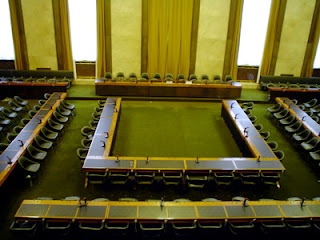 How might a room like the Council Chamber in Geneva, the scene of over a decade of floundering Conference on Disarmament (CD) meetings, prime diplomats for a new session of work? As you can see from the photo I’ve included with this posting, the Council Chamber’s drab green and gold murals tell the tale of human suffering and toil. Heavy green curtains make sure not a sliver of daylight peeks through and the Chamber’s walls bring to life murals like “The Conquerors,” “The Conquered” and “The Death of Freedom” (which themselves are a little on the surreal side). And the Council Chamber sometimes feels more like a museum than a working disarmament body, such is the reverential hush of CD meetings there, as interventions are delivered and translated through elderly surgical plastic wired earpieces to formally attired diplomats. A legacy of deadlock sends one message to disarmament diplomats. But perhaps murals that portray human struggle, in the drabbest of drab colors with no natural light, send another. It just might put diplomats in the wrong frame of mind. Of course, I’m not making the claim that simply changing the room would be the difference between success and failure in the CD. But it might be a start. Regular readers of the Disarmament Insight blog will have gathered that, among many things, we're interested in the impacts of technology on international decision-making. Patricia Lewis, for instance, has offered some of her personal observations about the changes mobile phones and Blackberries have wrought on interactions in multilateral meetings she's attended (See "Zapped! Mobile technology in the conference chamber"). There seems little doubt that continued improvements to wireless communications have radical implications for the coordination of international activities at many different levels. For instance, The Economist newspaper ran a story on 26 July entitled "Flood, Famine and Mobile Phones". In it, the Economist argued that technology is transforming humanitarian relief - and shifting the balance of power between donors and recipients. It all sounds great. But the Economist conceded that - beyond anecdotal evidence - there isn't a definitive verdict yet on how much of a difference such new technologies have made in achieving more effective humanitarian aid delivery. Nevertheless, the evidence has been compelling enough to result in a brace of new initiatives. Non-Governmental Organizations have begun forming consortiums like NetHope, which spreads the cost of satellite communications and internet links. UN agencies like UNICEF and the World Food Programme have taken a particular interest in trying to achieve practical benefits in aid delivery from better communications, activities which should (in principle at least) result in superior coordination. Meanwhile, even in the poorest parts of the world, technologies like mobile telephony are increasingly widespread. It's likely that such technologies really do have the capacity to transform aid delivery in some disaster situations - if donors and deliverers of aid are willing to listen to feedback from aid recipients and, of course, if the technological infrastructure itself still works or can be made to work in the midst of the disaster (a big "if" indeed, and glossed over by The Economist). In other words, accountability is important, even in apparent situations of altruistic giving like disaster relief. Accountability is something we would do well to bear in mind in disarmament and arms control. In a recent book, former British diplomat Carne Ross argued that diplomats are a largely "unaccountable elite", who often don't take into account the interests of those they are supposed to be helping or representing, drawing on his personal experiences in the UN Security Council setting. It's possible Ross over-states his case in parts. But in multilateral arms control there does sometimes seem to be a considerable distance between negotiators and those affected by lack of multilateral results, for instance on controls on small arms or the humanitarian impacts of cluster munitions. It's a bit like the white van driver who may not care if she drives inconsiderately or even dangerously. The vehicle she drives belongs to the business she works for - it's hard to identify her or make her accountable. So in places like the United States, lots of business vehicles now come with a "how am I driving?" sign on them along with a hotline telephone number. Is 0800-HOW-IS-MY-DIPLOMACY? connected to a television hotline or Parliament maybe? One question we perhaps need to ask is this: How - beyond their convenience - can new technologies make decision makers more accountable, and therefore more effective in achieving disarmament and humanitarian goals? Domestic electorates know remarkably little about what their diplomatic representatives do on their behalf overseas, and might be surprised at the degree of preoccupation of multilateral practitioners with process. Voices from the field therefore need to be heard and heeded more often. Carne Ross, Independent Diplomat: Dispatches From an Unaccountable Elite, London: Hurst: 2007. 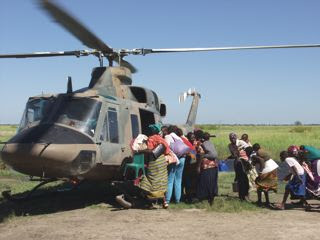 Photo (Namibia: Helicopter rescues people from flood hit areas, Image ID: 20044304) courtesy of IRIN. In 10 minutes of off-the-cuff concluding remarks from our 25 May Disarmament Insight symposium on ‘Human Security, Human Nature and Trust-building in Negotiations’, John Borrie talked about what he calls “cognitive ergonomics” and the relevance of the concept in thinking about the structures and procedures in multilateral negotiations. Cognitive ergonomics is also discussed in his introduction to the Disarmament as Humanitarian Action project's third volume of work, which you can access by clicking on the book with the pink cover at left.